The fourth episode in the Showtime series The Borgias is a treat for fans of Renaissance history. The art historical references are not verbalised, but are still fantastic to behold and contemplate. Further liberties are taken with the story, particularly the arc following Cardinal della Rovere, but it was still remarkably enjoyable to watch. The music in the wedding scene will also ring familiar to lovers of Renaissance and early music. This is also the episode where we are first given a glimpse of Renaissance Florence, presently under the spell of Dominican friar Girolamo Savonarola. The opening of this episode will be a heart stopping moment to anyone familiar with the history of Renaissance Florence. It was mesmerising to see Savonarola spewing words of chastisement to the Florentines. We get a nice taste of the awe and terror his fiery sermons would have caused. A short clip of a segment featuring Savonarola can be seen below, courtesy of Showtime. 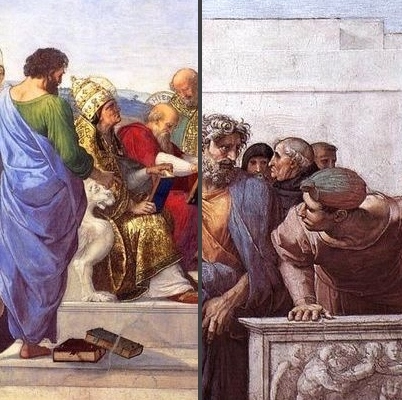 Watching the worried faces of the people in the crowd, I instantly thought of the life changing effects these sermons had on artists such as Botticelli and Michelangelo, although no mention of either artist was made in the episode itself. Botticelli in particular seemed to be the most affected, with subsequent works such as a series of Pieta scenes and the Mystic Nativity indicating the intense spiritual reflection Savonarola's message had caused. 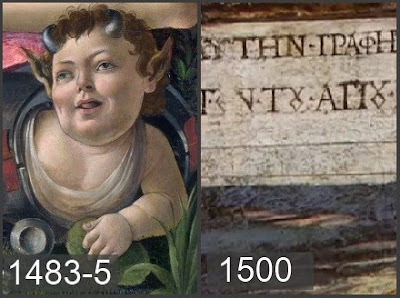 Botticelli went from painting playful satyrs to inscribing his works with fearful quotes from Revelations in Greek. For more on this topic, read the previous article on the dark psychology of the Mystic Nativity. 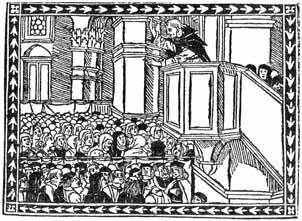 Later in the episode, we get to experience Savonarola reciting his infamous vision regarding the invasion of Italy and Florence as it is recounted directly to della Rovere. This meeting is not recorded, nor is the assassination of the Borgia spy in the Basilica di Santa Maria del Fiore. Rather than be distracted by these liberties, I would say the writers are romanticising the notion of della Rovere as the future 'Warrior Pope' Julius II, whose direct involvement in the War of The League of Cambrai resulted in the deaths of thousands. Artists commonly re-interpreted historical and literary sources to suit their own aims, this artistic license should also apply to dramatists, who are not obliged to be documentarians in this context. Although we have no record of any meeting between della Rovere and Savonarola, the writers of the show are not inaccurate in representing della Rovere and Savonarola as having an affinity towards each other, as the two did share a mutual wish to rid Italy of the Alexander VI. Della Rovere's regard for Savonarola is best illustrated in the c.1508 fresco by Raphael, known as La Disputa. It was painted for the Stanza della Segnatura, a very short distance from the bedroom occupied by della Rovere when he became Pope Julius II. Among the crowd of Christian luminaries, we also have Savonarola. There is a degree of irony to be observed in this instance. Had the Dominican monk been alive, it is unlikely he would have been pleased with some of Julius II's financial policies in particular. In some sources a bearded figure on the right dressed as pope is cited as Julius II. This is unlikely. Historical records reflect the great fuss over Julius's decision to grow a beard - which occured in 1511, some 2 years after La Disputa had been completed. Although not verified by documenation of any sort, it is widely believed that Julius II was depicted as a clean shaven Saint Gregory, with Savonarola shown as an aging monk. Lucrezia's wedding to Giovanni Sforza was celebrated on 12 June in 1493, although it was notarised in February of that year. Hence, this episode is set immediately following the events of the previous installments set in 1492. The wedding is nicely depicted, with snippets of authentic early music. Accurately, a performance of the vulgar comedy Menaechmi(The Twins) by Ancient Roman playwright Titus Macciatus Plautus is also recreated as part of the wedding celebrations. The episode depicts this play as a great success, although the historical record indicates it was cut short by Alexander VI who found it boring! The episode ends with the unpleasant consummation of the marriage, a point which still divides scholars. It is known that the Pope had expressed that the marriage could not be consummated until November 1493, on account of Lucrezia's age, though some argue it was to allow time for him to expediently rescind the marriage if a more favourable political union were to present itself. The consummation of the marriage seems to be at the centre of later claims around incestuous relations between Lucrezia and members of her family. This will likely be covered in subsequent episodes, so I will leave comparison to the historical record on this matter to a later post. 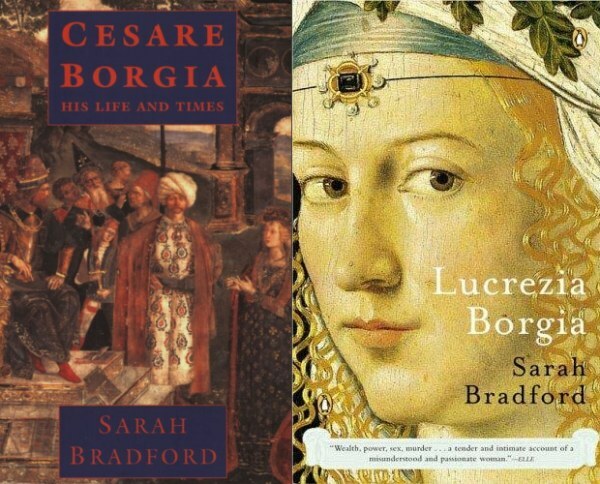 For those wanting to read a bit more about Lucrezia and her wedding(s), I thoroughly recommend Sarah Bradford's biographies of both Lucrezia and Cesare. I have read some negative reviews of the Lucrezia book, though find this unwarranted as an exploration of Lucrezia without examining the dealings of her extended family would simply be incomplete. There are some other great reference works for this era of history that will be mentioned in later reviews, though these are a good start to anyone interested in learning more about the history behind the series. It was nice to spot David Bamber, who played Cicero in HBO's Rome make an appearance as the former husband of the Borgia matriarch. Watching Cesare's reactions to the wedding was also interesting, and somewhat indicative of the direction the show is taking regarding the relationship between the siblings. Fans of Renaissance literature will also catch Cesare's reference to sprezzatura, the courtly nonchalance described by Baldasare Castiglione in The Book of the Courtier - which did not appear until 1508. Cesare's flirting with one of the wedding guests is very much in the spirit of sprezzatura, though Castglione's recording of it was still some 15 years away. Most lovers of Renaissance art and history will have a soft spot for the Medici. Despite their later excesses as Grand Dukes of Florence, the Medici of the 16th Century loom large in the history of commerce, politics and art. Knowing this episode was set in 1493, I sadly resigned the hope of seeing Lorenzo the Magnificent - who died in 1492. Meeting instead with Cardinal della Rovere as the voice of Florence was Lorenzo's son Piero and Niccolo Machiavelli, described later as an ambassador. It must be noted, Machiavelli was not elected into an official position in the governing Chancery of Florence until after the Medici were expelled in 1494. It was fabulous to see these characters interact, and discuss the concept of a unified Italy. In actuality, there is no record of this meeting. Piero is remembered in history as 'the unfortunate' as he was head of the Medici family when it was forced to flee from Florence in 1494. This was partly due to antagonism caused by Savonarola, but largely because of his ineffective negotiations with French King Charles VIII upon his entry to Tuscany in 1494. Machiavelli's role is interesting, and somewhat in keeping with the shrewdness his writings are suggestive of. His most famous work, The Prince, is believed by some scholars to have been primarily formulated as an exultation of Cesare Borgia. However, there is no hint of any such reverence at this early point as Machiavelli had not yet witnessed Cesare's own bid for power and territory, which occurred at a later point in time. There is a cute little scene where the Pope is instructing the young Gioffre Borgia about the present political situation in the Italian City States. Some may find this a little patronising and simplistic, but I thought it was a great addition. Not everyone watching the show will be aware of Italy being comprised of separate kingdoms and territories, each with different ancestral ties. This was a clever way to get everyone on the same page. Nice! I loved young Gioffre's exclamation that he would marry anyone if it meant his father could sleep better. This does in fact resemble what young Gioffre ended up doing. Pinturicchio seems to finally be given a break, and does not appear in this episode, nor does any other artist. We do have three most noteworthy appearances, all from the brief scenes in Florence. The first of these is of course Brunelleschi's famous Dome, shown in the scene where della Rovere enters the city. In Savonarola's cell, we get a glimpse of Fra Angelico's famous Last Judgement. Whilst Fra Angelico did indeed paint monastic cells, it is less likely his Last Judgement was executed for this setting. This piece was painted for the Church of Santa Maria degli Angeli and is historically noted to have been placed near the space reserved for the choir during mass. The final, and perhaps most enthralling glimpse is Paolo Uccello's Battle of San Romano - which we know was at the Palazzo Medici at this time, after having been acquired, and cropped by Lorenzo the Magnificent. It forms the backdrop of a dining hall where della Rovere meets Piero and Machiavelli. Records do tell us that this piece was in Lorenzo's bedroom, not in the dining hall. Nonetheless - it was exciting seeing this piece reunited - the 3 parts of it are now divided among London, Paris and the Uffizi in Florence. 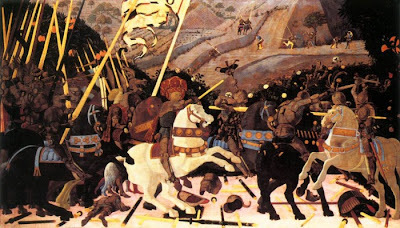 The panels seem to be shown backwards, most notably seen in the central figure(Niccolo da Tolentino) wearing the red headgear in the London panel. It is likely this is an editing room issue, either by accident or to correct an error in the placement of the set design - it is easier to horizontally flip a film frame than assume set decorators painted a reversed version of this detailed piece. Below is a picture of the broadcast image and the 'h-flipped' correction. Savonarola is finally on the scene, and we are entering those tumultuous years in Florentine history that culminate in the bonfire of the vanities. Will we get a glimpse of Botticelli, or hear Savonarola preaching against sensuous images? We can only hope so. It will be great to see how the writers handle the political machinations revolving around Lucrezia and her alliances forged by marriage. French King Charles VIII's entry into Italy, and his famous meeting with Savonarola would be memorable to see as well. Congratulations, your review makes me want to see the series despite my earlier aversion to historical popularization. Just one thing. Did they miss the opportunity to introduce Savonarola with the famous deathbed scene of Lorenzo the Magnificent? Hi Frank! Regardless of the artistic license, I think any fan of the Renaissance would enjoy this series. Seeing these things we have read about for so long brought to life is always exciting. I also find looking for the art historical references and discrepancies a fun challenge as well. As for the Lorenzo death bed scene, it is not in this episode, which takes place in the year following Lorenzo's death. I think there was too much going on the Borgia household in 1492 to make a trip to Florence worthwhile that early in the series. I am so glad you are doing this recap. I have been watching The Borgias and loving it, particularly as an art historian. 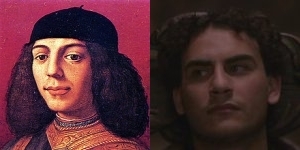 I recognized Uccello, but not that it had been flipped. 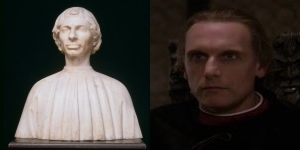 Also, I loved seeing the Savonarola character appear, but that he looked nothing like the portraits. They are doing a great job with the sets and costumes. Fun review. Like Frank, this makes me want to watch the series. @Martha - I would say the producers opted for an actor that had that intense presence as opposed to one that just looks like the portraits. It's such an integral part of this character! @M - I think you'd love it. I'm sure you would have spotted the Uccello error too! I also would recommend it to students of Renaissance art and history - using it as a way to test what elements they can recognise and what corroborates with the historical record. Reading your reviews of the second season made me order up disks from the first so I can see what you are talking about. As a historian, the historical anachronisms don't bother me (great trash novel writing), but the music does -- "Zadok the Priest" by Handel for the papal coronation, music written for Elizabeth I for the wedding in this episode. Did they think viewers could handle the really nasty violence but not slightly different music. The second season has been fascinating - especially fun to get the apocryphal flashing from Caterina Sforza and Botticelli throwing his mock-primavera into Savonarola's bonfire. The music of the series is commonly asked about - which I hope to be presenting a guest post on soon. I will admit, I am even less fussed with musical anachronism - especially when music is not the focus of the program. If it was a series about the life and times of Mozart, then it would be weird to have Beethoven piping up in the background!